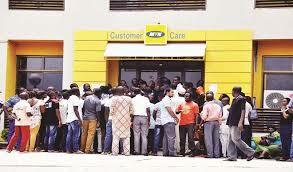 MTN Nigeria office in Abuja, the Nigerian capital, was invaded on Thursday afternoon by a group of angry Nigerians protesting the continued Xenophobic attacks on their fellow citizens and other Africans in South Africa. A senior manager in the MTN Abuja Office located in the Maitama district told News Express: “We had to hurriedly lock up and go home. I don’t see them as protesters but as people who came to steal and cause confusion. The source condemned the invasion, noting that the protesters could have made their point in a more civilised way. He said: “Nobody is happy over what is happening in South Africa. I understand that people have the right to be angry over what is happening there but this is not the best way to go about it. “They could have come here and say, ‘Shut down this place; you can no longer operate’ but not to attack Nigerians who work here and those who came here to repair their phones is unfortunate”.